Amber began teaching swimming lessons in 1997 at a backyard swim school in Northern California. In 1999, she and her husband Tad decided to move to Huntington Beach. Soon after her move to Southern California, Amber decided to look for a local swim school to start teaching again. In her search she found that none of the schools in the area taught swim lessons with the same style and commitment to each individual swim student that she was used to. So, in the summer of 2000, "Amber's Swim School", was born. Amber started out her school by traveling to various private backyard pools in Huntington Beach and Newport Beach. Then, in the spring of 2006 Amber's dream finally came true when she had her own pool built. She now operates "Amber's Swim School" out of her backyard. 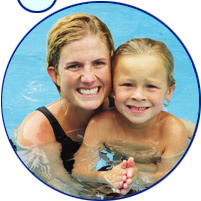 What makes our swim school unique is that we only offer private lessons (one child to one instructor). These types of lessons produce excellent results because the swim instructor is able to adapt his/her teaching methods around the needs of each individual student. Also, the student has more swimming time during their lessons and they are able to learn at their own pace. Our teacher's are Red Cross certified Water Safety Instructors and they teach according to the Red Cross standards. Please refer to the Red Cross Swim Levels link, to more fully understand what your child will learn as they progress through each level of swimming.